Professor Anselmo Reyes served as a High Court judge for nine years before joining HKU in 2012, after 14 years as a barrister. He is also a sitting judge of the Singapore International Commercial Court. These experiences have all given him an empathy for the challenges facing judges today – and a concern for where judiciaries, especially in Asia, are heading. “The demands on today’s judiciaries are such that one cannot expect judges, even those who had extensive legal practice before being appointed judges, to be able to deal with the whole range of cases that are likely to come before the courts,” he said. 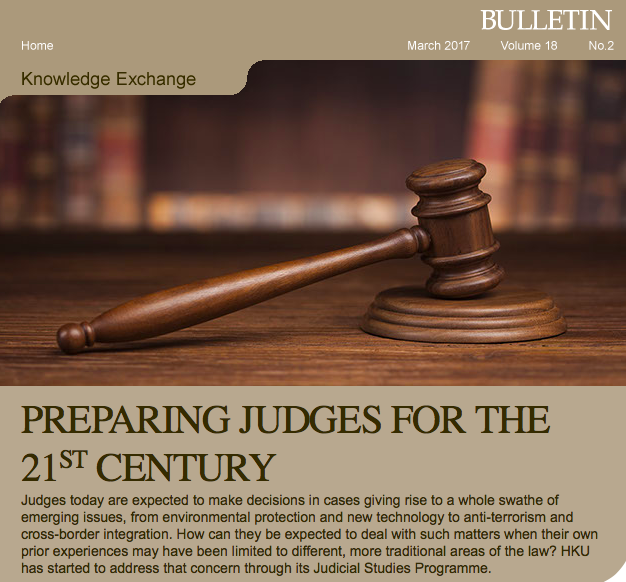 That insight inspired the Faculty of Law to found the Judicial Studies Programme (JSP) in 2013. The JSP aims to help build capacity among judges in Asia and elsewhere to deal with the complexities of contemporary life, and to provide workshops and public talks on matters pertaining to the judiciary and what judges do... Click here to read the full article.